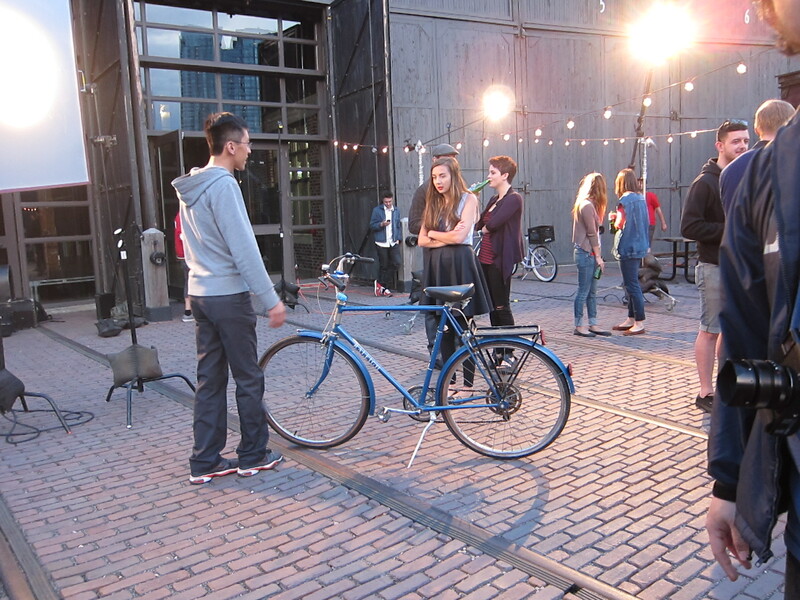 Director Hiep Vu with Super Spinstar Colleen Kirley and the first 'pick up' rider, Miyako Kurihashi in waiting. Photo by Hanson Ng. Story, and some photos, by Tammy Thorne. Black & white photos by Hanson Ng. 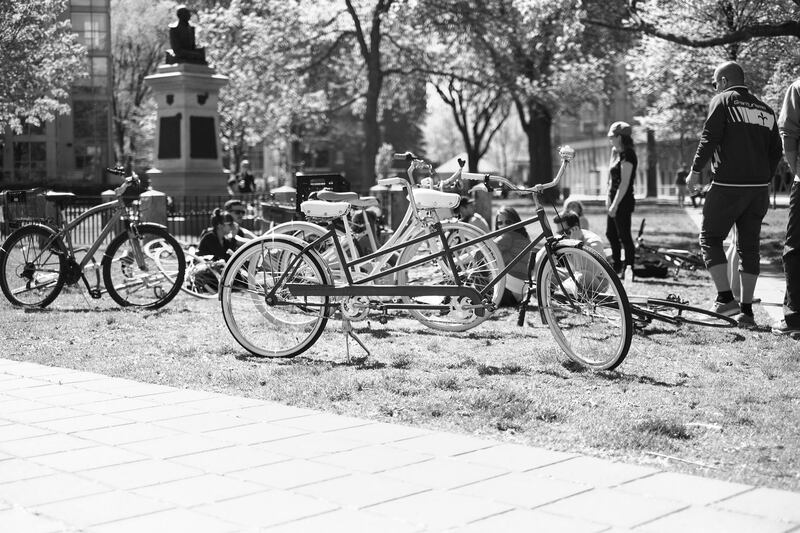 This summer, dandyhorse magazine teamed up with filmmaker Hiep Vu and Steamwhistle to make this sweet video: Super Spin. You can watch the video from our homepage or from our YouTube account here. 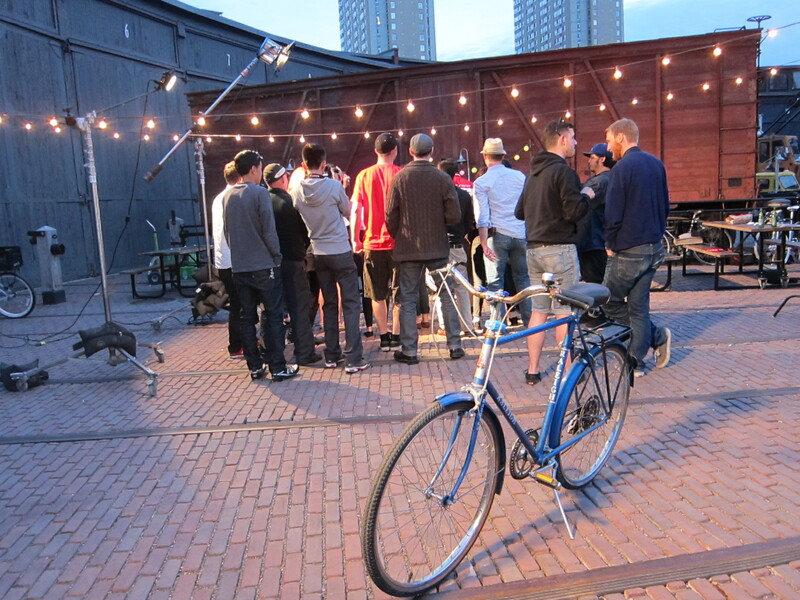 dandyhorse magazine and Steamwhistle remind you to walk it or lock it if you've had too much to drink....and to love your ride! Subscribe here. What was it like working with all those bike people? It was great. 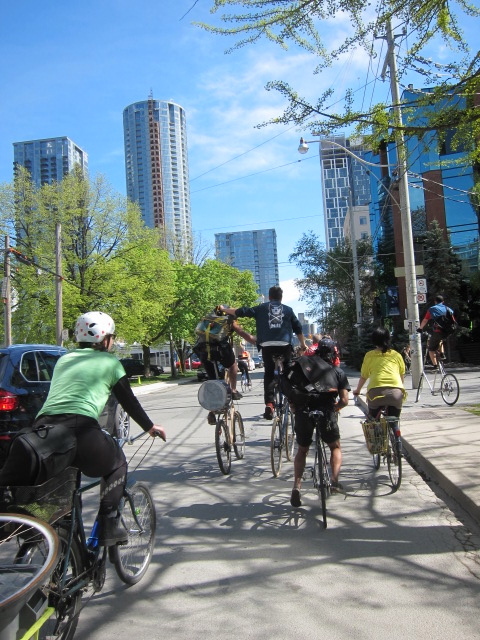 I consider myself a bike person too, as I ride my bike practically everyday, and mountain bike as much as possible (especially in the Don Valley). So it felt like family. What was the most challenging part of the shoot? 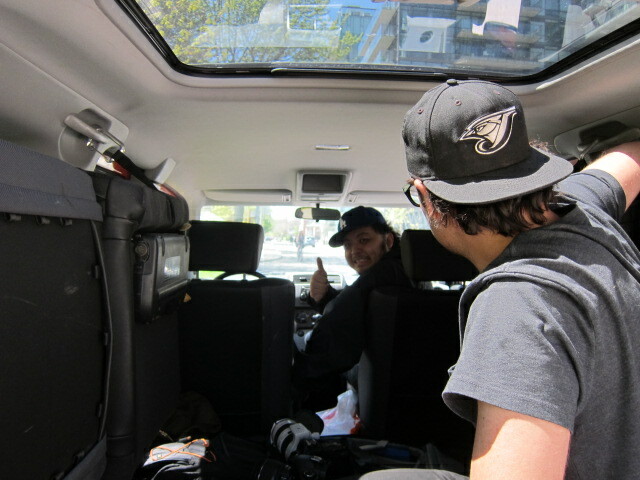 The most challenging part of the shoot was trying to get as many of the shots completed in the little time that we had. We could have used more people, time, money, everything. It all worked out but it was very tight. What was the most fun part of the shoot? The most fun was trying to devise new shots to shoot the cycling. There are a million ways to do it so we tried to make it as visually interesting as possible. Why were you interested in volunteering your time for this project? The main reason was that I thought the video had an interesting story, and that there were lots of opportunities to have fun visually. I think we totally achieved that. Much thanks especially to Monica Remba at Stealing Time Editing (she really hit it out of the park) and Conor at Alter Ego Post for making it look amazing. What is your favourite moment in the video? 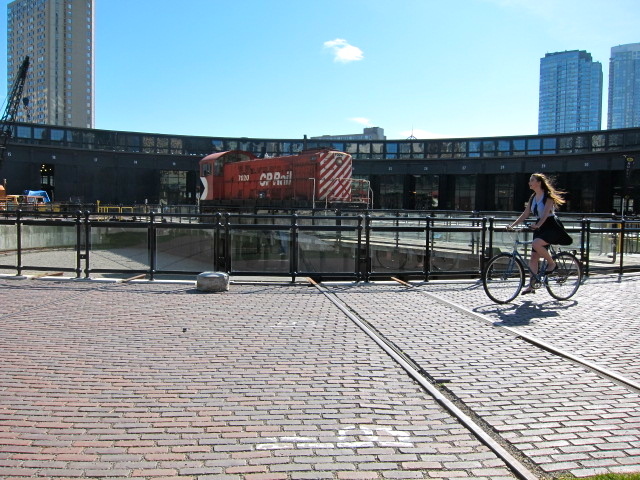 My favourite moments are the beauty shots of Colleen riding her bike. She looks great. 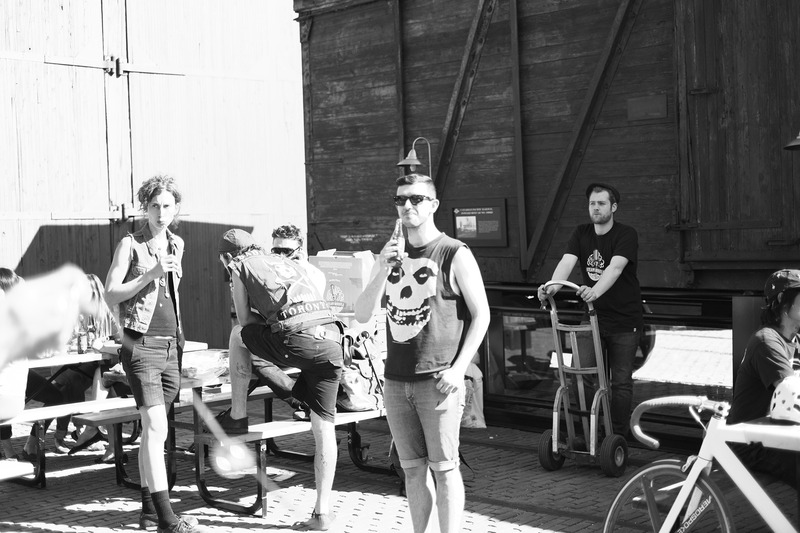 Thanks for putting up with us the whole shoot. Second best is the crowd scenes at the end. People look genuinely happy! With a nod towards our just-released youth and employment themed issue, I want to ask; why you decided to become a filmmaker and what some of the challenges are in pursuing that as a career? I started out as (and continue to be) a photographer, so the transition is fairly natural. I've always been interested in creating beautiful images and telling stories. The industry is very small so it is quite difficult to get a foothold and operate at the level that you wish to. At the same time, technology has made it easier and easier to create and share with everyone in the world. I'm pretty happy with the progress I've made and the pieces I've produced since I've started, but I'm constantly striving to do better work. Toronto would be a better place if ____. ... our mayor owned a bike. Any shout outs you’d like to add to our long list of thank yous? Thanks to everyone that worked on the video. Warren and Hanson worked their butts off to make it happen. 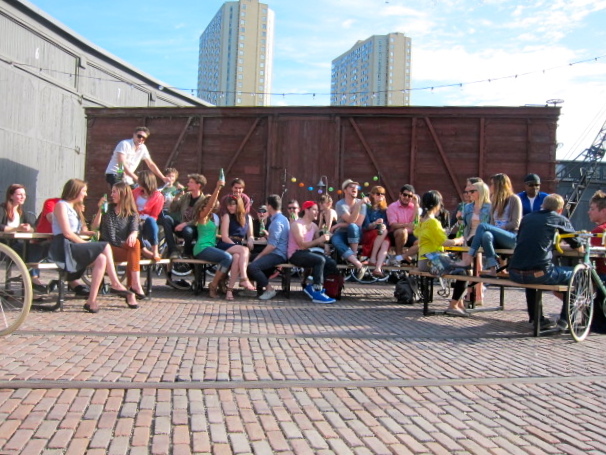 Shane at Steamwhistle did a great job in making sure everyone was happy on set. Photos below by Tammy Thorne. Black & White photos by Hanson Ng. Hanson gives the thumbs up while Warren looks on. Director Hiep Vu speaks to the crowd. 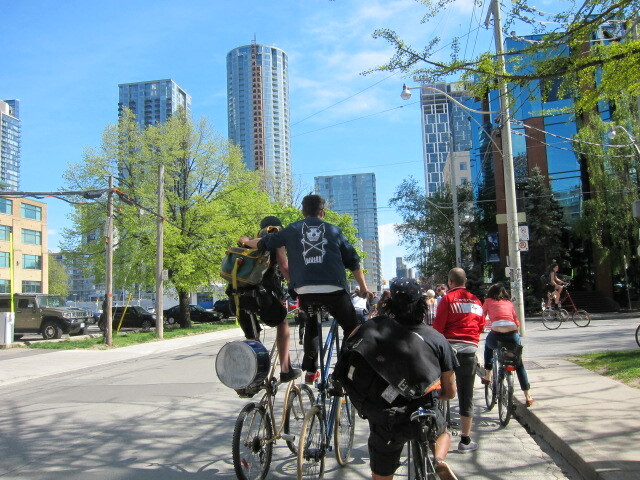 The tall riders from the Bad Taste Bike Gang added some fun to our group ride to the roundhouse. 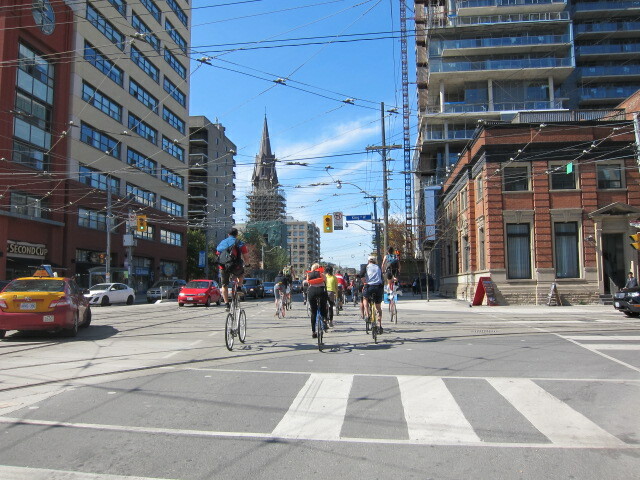 We did a little roundabout tour on our group ride to the roundhouse so the guys could get lots of shots. 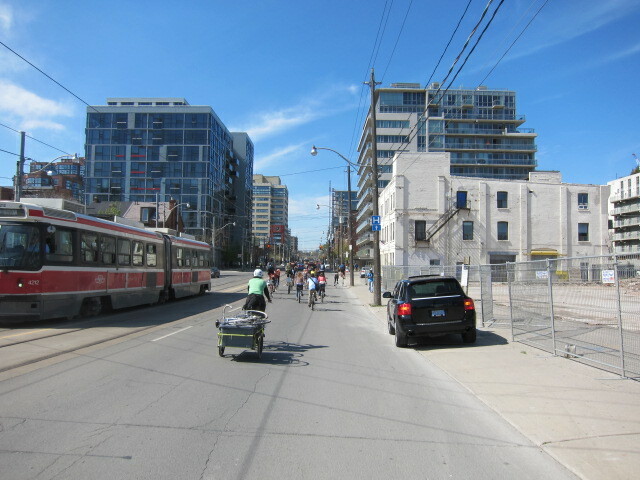 Front Street east of Bathurst. Colleen leads the pack... into the roundhouse for the second part of the shoot. Why did you do the video? I'd never been asked to do anything like this before! When Tammy initially asked me to be in the video, I assumed she meant behind the scenes! I did the video because I love dandyhorse and I love my bike! Did you know about the band Attagirl before this shoot? I had never heard of the band Attagirl before Hiep suggested them for the video. But as soon as I heard their music, I was hooked! What is your dandy background and how are you affiliated with the magazine? I worked alongside Tammy Thorne as her dandy sidekick (read: Assistant Editor) for the Spring 2011 and Summer 2011 issues. 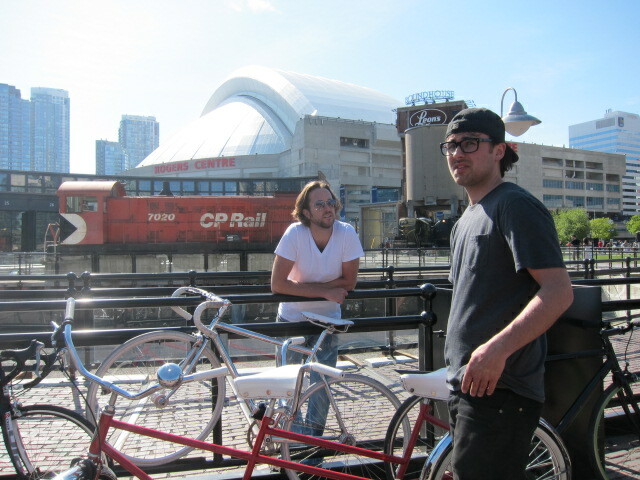 The bike that I rode in the video was found by my dad in the garbage. It's a cruiser, but it definitely has some character -- the handlebars are rusted, the paint is coming off... It's a little scrappy. But that's why I love it. In general, I love my bike because it's the best and most efficient way to commute in the city. Hands down. 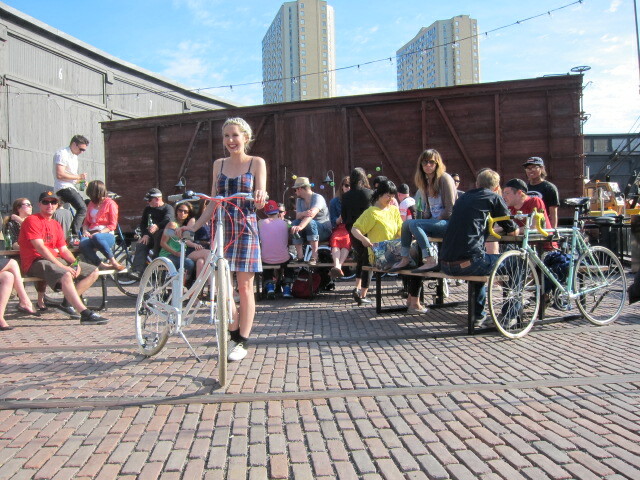 My favourite part of the shoot was when the hoard of bikers (some on tall bikes, two on a tandem; a handful of fixies and single speeds, among many others) biked together to the roundhouse. 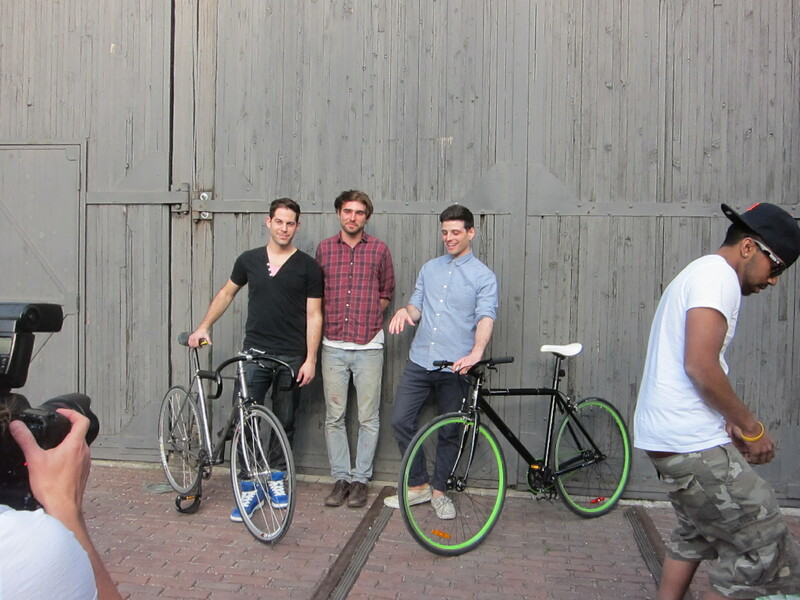 The looks we got from pedestrians were priceless -- but we must have looked like the friendliest bike gang in town. 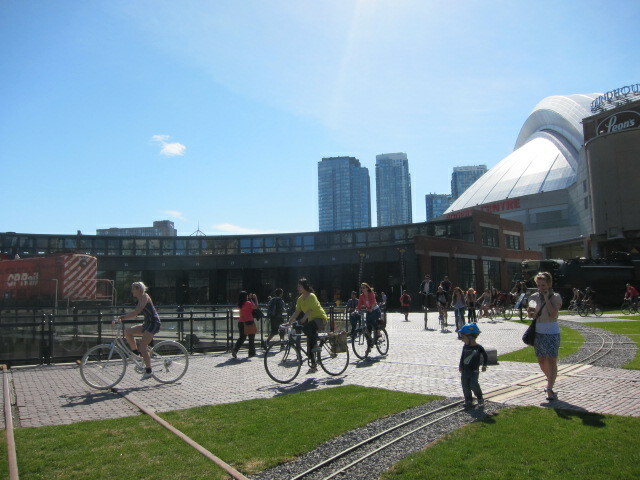 Group ride into the roundhouse. I think Hiep is asking them to do it [ride in] one more time. Photographers Mike Ford and Warren Hyrcun. 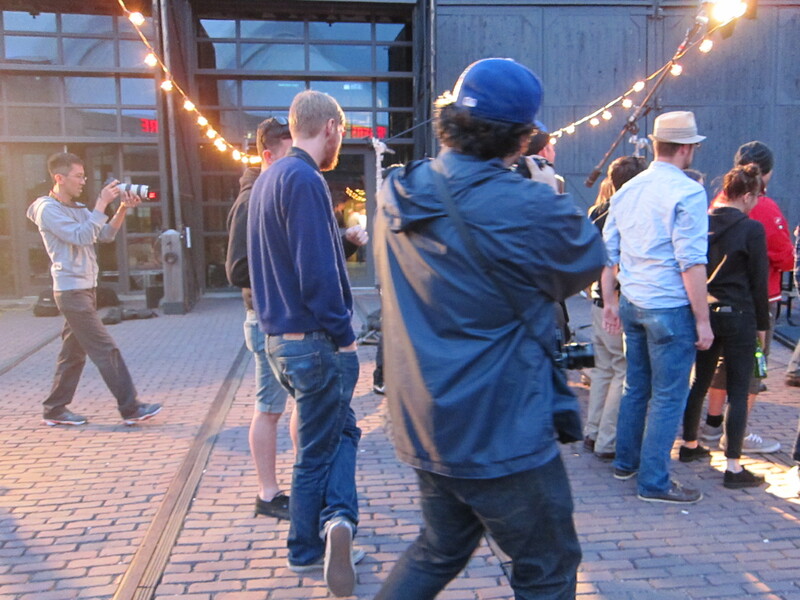 Mike Ford setting up the shot for the fashion spread in the Summer issue of dandyhorse. 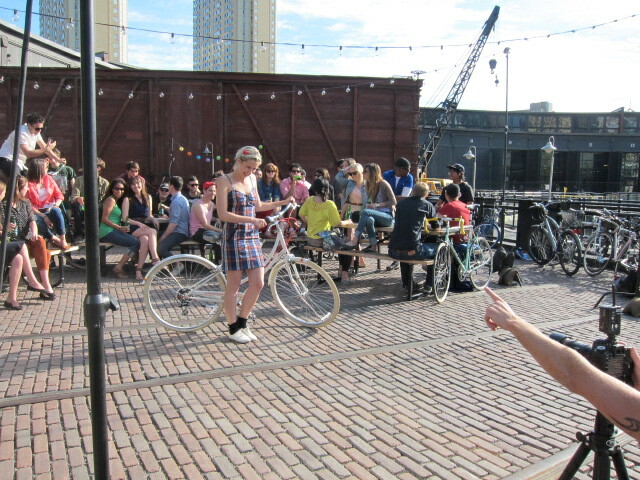 The dandyhorse summer 2012 fashion shoot by photographer Mike Ford in action. The band Attagirl with fans. dandy Photographer Mike Ford shoots the band Attagirl for dandyhorsemagazine.com while this guy, randomly passing by, stopped in with his friend for some free beers at our party. They were then required to drink them with me and pledge they would ride their bikes to work the next week, before leaving the set. 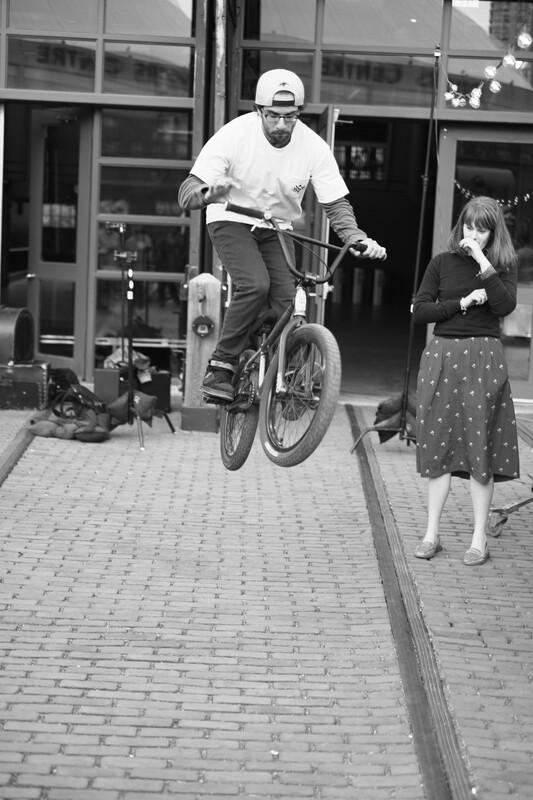 The tandem shot was a no brainer for filmmaker Hiep Vu, featuring our dandy designer for the summer issue, Dave Murray, and his girlfriend Cat. 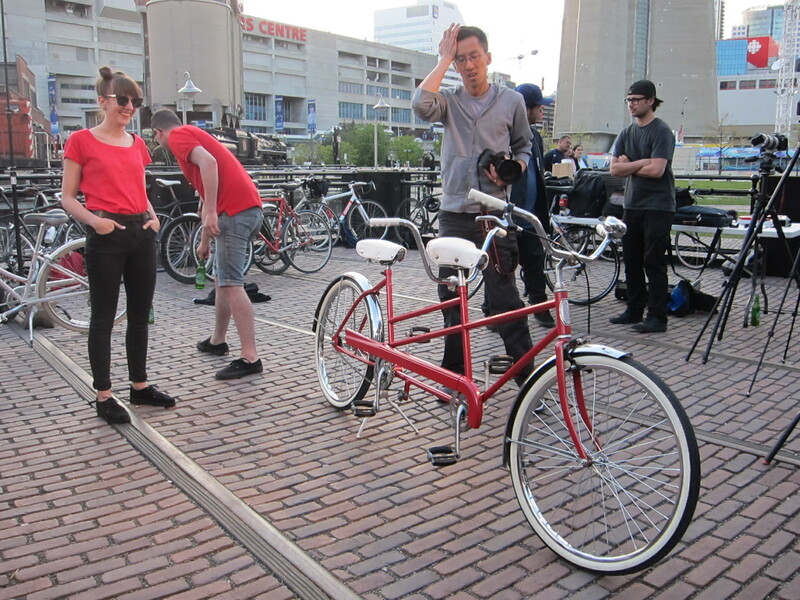 Hiep had them change into red shirts to match the bike. Hiep and Colleen and the bike. 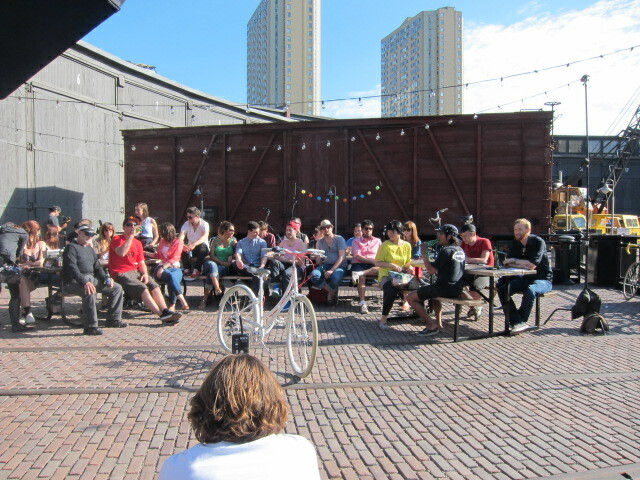 The many wonderful bikes featured in this video are the real stars of the day. Photos below by Hanson Ng. Photos by Hanson Ng. 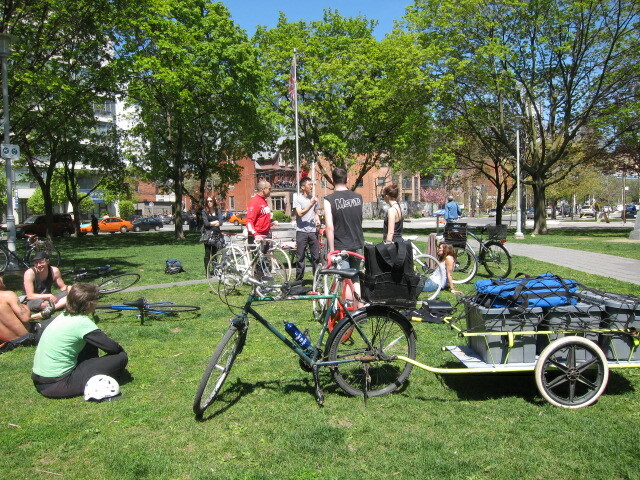 We started the group shoot at Victoria Square park. A really cool historically significant park at Wellington and Portland. 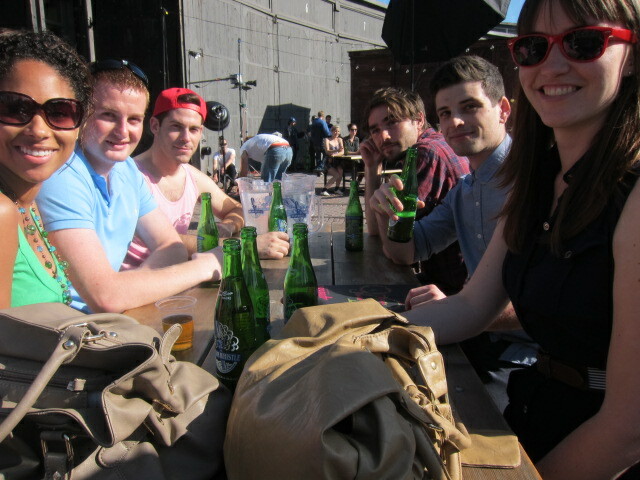 Steamwhistle host with the most, Shane (right) along with dandyhorse Summer 2012 designer Dave Murray and Bad Taste bike gang members. Thank you Steamwhistle. And thank you to every one that has ever contributed to dandyhorse magazine! Thank you again to all the volunteers who worked on and participated in the making of this dandy video! Thank you: Hiep Vu, Warren Hrycun, Hanson Ng, Monica Remba, Mark D’Amico, Conor Fisher, Wiliam F. White, Stealing Time, Alter Ego, Betina Lou, Freedom Clothing collective, Mike Ford, Randy Chung, Two Wheels Green Delivery, Bad Taste Bike Gang, the band Attagirl; Edward Kingsley, Don Joseph Cohen, and Aaron Zack and our super spin hero; Collen Kirley, and everyone who showed up for the shoot! Thank you Miyako Kurihashi, Kevin Barnhorst, Eric Plaxton, Pete Byer, Andrew Travis, Katherine Barwig, Cat Waszczuk, Dave Murray, Chris Silva, Tomahawk Spunt, Ramen Benyamin, Alyssa Hubin, Canice Gallinger, Leila Kent, Tenille Clarke, Andrew Romashyna, Laurie Featherstone, Alyssa Garrison (our model in the Summer 2012 fashion shoot taken during this video shoot! ), Mark Harmon, Chocis Lo, Sarah Anderson, Greg Polimis, Chris Simonen, Reba Plummer, Leigh Lichtenberg, Will Canel, Steven Huynh (a cyclist with a guitar on his back who joined us during our group ride along), Bruce Gavin Ward, Claire MacDonald, Natasha MacEachern, Satchel D. Boyd, Josh Zachariah, Chase Brokenshire, Madeleine Scott, George Carijntan, Scott Carluccio, Peter Dai, Martha Beach, Alexa Erdei, Adrian Gillis, our amazing make-up artist Amy Liz Wilbur and again, Shane at Steamwhistle. You can watch Super Spin, the dandy video on YouTube here. You can order the current issue of dandyhorse magazine here. Photo of Chris Silva by Hanson Ng.